When Caesar and Sam visit our Carinya Aged Care Residential Unit, they lift everyone’s spirits. 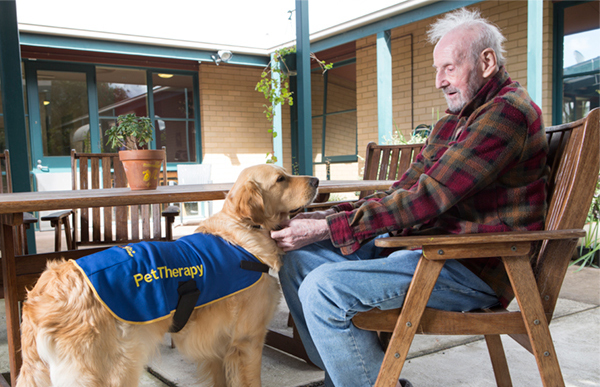 The residents of Carinya live with a range of dementia-related communication and physical difficulties, and the dogs’ visits bring pleasure, comfort and kindness. Marion Sparrow, a diversional therapist, sees just how effective pet therapy can be for older people with dementia. “Pet therapy was introduced to Carinya Residential Care Unit in 2015 because some new residents had problems settling in. The dogs are also wonderful therapy for residents who find it hard to socialise with others because of communication difficulties, physical disabilities or mental illness. “It’s often the residents who have limited social contact who respond most positively to Caesar and Sam’s visits. One gentleman really enjoys when the dogs let him pat them. He even shares his biscuit tin with the dogs and loves talking to them. Another resident who does not tolerate other people or staff, genuinely greets the dogs as old friends and spends a long time talking to them and watching them play.